Expressive of luxury in an indulgent way, Royal North India Tour is a wonderful way to voyage into the regions that were strongly linked with the power and royalty. From Delhi, the discerning traveller is transported to epitome of extravagance, Agra and its citadels of power and love. Later, they experience the immaculate touch and thrills of royalty in the land of kingdoms, Rajasthan through a visit to Jaipur, Udaipur and Ranakpur in great style and panache. Arrive in India's delightful capital, Delhi, where you will be greeted with a traditional Indian welcome and escorted to The Oberoi (Premium Room) by Incredible India tour representative. Enjoy Delhi city tour today. Drive along the Lutyens Delhi - Rajpath, the capital's broadest avenue, across the drive look through the Parliament, the Presidents House and India Gate. 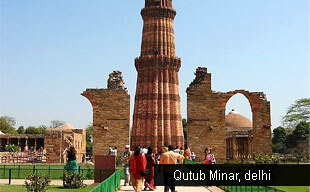 Visit the Qutab Minar, Birla Mandir, a colorful and modern Hindu temple. Among your stops are the Red Fort, a spectacular fortified complex built by Shah Jahan, with its Pearl Mosque, palaces and audience chambers; Raj Ghat-the memorial built for Mahatma Gandhi, the father of modem India; the Ashoka Pillar and the mile long Chandani Chowk Bazaar. Overnight The Oberoi. 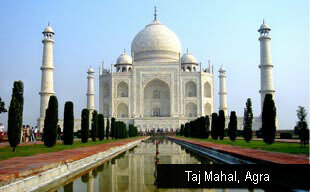 Check out Delhi and drive to Agra (203 km / 4 hr), the land of Taj Mahal, a melodious sonnet in marble. Begin the Mughal discovery of Agra with a visit to the Agra Fort replete with its battlements, apartments, gardens and halls of audience. Witness the epitome of Mughal craftsmanship with a visit to the magnificent Taj Mahal during sunset. Overnight at Oberoi Amarvilas Hotel. Begin the morning in Agra with breakfast and later move in towards the excursion to the abandoned city of Fatehpur Sikri. Built by Emperor Akbar in the 16th century as a capital, this ghost settlement is remarkably well preserved and presents culmination of Muslim and Hindu art and architecture. The afternoon is at leisure in Agra. Evening is optional for shopping. Overnight at Oberoi Amarvilas, Agra. Optional early morning visit to the Taj Mahal offers an opportunity to gaze the monument as the rising sun graces the landscape. Check out Agra and drive (201 km / 5 hr) to Ranthambhore, where numerous tigers still roar and prowl the ruins along with other faunal species. Also, a craggy 1000 year fort complex is a part of Ranthambore's heritage share. Upon arrival here, check in the luxury camp on the private reserve of the local Maharajah. Begin the first game drive in the noon time for the maximum sightings. Overnight at Jungle camp. Ranthambbore is one of the few reserves in India where the camera shy tigers can be seen in daylight. Thanks to the Project Tiger initiative that the Bengal tiger's population is increasing continuously. The whole day is dedicated to the thrilling game drives (morning + evening) to have a wholesome experience in the wilderness of Ranthambore. Return to the overnight camp. 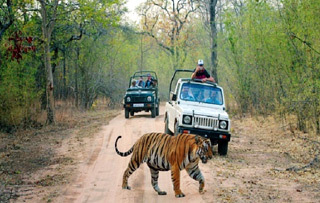 After a morning game drive and breakfast, check out Ranthambore for the Jaipur (130 / 3 hr). The city laced in elegant pink, Jaipur is the city of royal forts and palaces. Upon arrival, check in the Raj Vilas Palace Hotel. In the beginning, the Jaipur city tour first takes you to the landmark of Hawa Mahal or "Palace of Winds". Next stopover in the city is the iconic City Palace. A part of it is still resided by the royal family and there is a small museum within the palace premises that makes it an enchanting experience. In the evening, stopover at the ancient observatory, the world heritage site built by Sawai Jai Singh who besides being the ruler was also an astronomer. Return to the Raj Vilas Palace Hotel for overnight stay. Begin the day with an excursion to the recently recognized world heritage site of Amber Fort. A hill-top fort, Amber is a scintillating example of Rajput architecture, with its large complex comprising palaces, temples gateways and ornate apartments. Afternoon is at leisure within the hotel premises. Check out Jaipur and take off the flight to Udaipur. 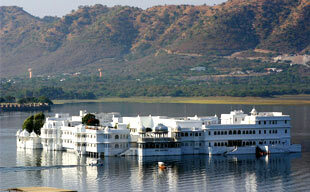 Famous worldwide as the City of Lakes, this city is considered the most picturesque and romantic in India. Blessed with leisurely royal charm, this city has many resplendent royal attractions to look out for. The attractions here include City Palace, Saheliyon ki Bari or Garden of Maids; and the folklore museum where you can see a presentation of the string puppet show typical to this area. Overnight at Udaivilas Luxury Resort. Devote this day to the beautifully sculpted Jain temples of Ranakpur. Represented in white marble, this sun temple is believed to be 500 years old. Stop for Lunch at Maharani Bagh, a mango grove and the private gardens of the Maharana of Jodhpur. Return to Udaivilas Luxury Resort for overnight stay. In the morning, cruise across the harbour to Elephanta Island and its famous caves, filled with carvings and sculptures dating back to 550 A.D. The afternoon is at leisure to relax and pursue independent activities. Late evening transfer to international airport for flight back home. (Hotel checkout 12:00 hr).